Via a 2011 compilation called Happiness Is… Peanuts Snow Days, we get two specials with Charlie Brown and company. The DVD includes two shows: 1980’s She’s a Good Skate, Charlie Brown (24:23) and The Charlie Brown and Snoopy Show Episode #18 (22:26) from 1985. In Skate, Peppermint Patty (voiced by Patricia Patts) trains rigorously for a figure skating contest. She endures an inability to stay awake in school and the unintelligible grousing of Coach Snoopy (Bill Melendez). We follow her path to hoped-for glory on the ice. Skate aired the day after the 1980 Winter Olympics finished, so at least it boasted excellent timing. Unfortunately, the special itself offers a bit of a dud. I assume this isn’t the only Peanuts program that focuses on Peppermint Patty, but I can’t recall any others. That’s probably a good thing, as she’s a lackluster lead. Patty works better as a foil to Charlie Brown; she’s off in her own world and the manner in which she provokes his befuddlement allows her to fare her best. Here we concentrate so much on her that the show lacks the necessary character contrast. In an unusual move, we barely see the regular Peanuts gang. Patty, Snoopy, Marcie and Woodstock dominate to virtually the exclusion of all else. Charlie Brown makes a brief appearance when Patty comes to get Snoopy, and the crew pops up in the crowd at the competition, but that’s it; they’re essentially not involved. The juxtaposition of tomboyish Patty and the girlie world of figure skating also seems odd. Wouldn’t the tale have worked better with any of the other Peanuts females? Sure, Patty’s the most athletic, but she never came across as a character with the grace and smoothness for figure skating; Patty’s more rough and tumble and not suited to the setting. Perhaps the show could’ve wrung some comedy from that “square peg/round hole” side of things, but it doesn’t. There’s very little drama at all and no conflict between the usual rough-hewn Patty and this program’s more refined one. The only minor tension occurs during a glitch in her performance, and that’s a small element. With Charlie Brown and Snoopy Show’s Episode 18, we get three short stories. The Peanuts kids stage a Christmas play at school, they fret about Valentine’s Day romance, and Peppermint Patty (Gini Holtzman) wins a prize for her essay about Snoopy. What an odd hodge-podge of tales! There’s no real connection among the different segments. Sure, the first two focus on holidays, though they don’t make much sense when you know the program first aired in October; that’s not exactly prime territory for Christmas and Valentine’s Day material. The Patty plot fits a bit better – hey, as long as it shows up during the school year, it’s fine – but the fact it doesn’t relate to a holiday means it seems out of place with the other two. At least these little segments go by quickly and don’t wear out their welcome. None of them provide particularly good entertainment, but none of them flop, either. They have their own minor charms and deliver some mildly interesting moments. At the very least, they’re better than Skate. 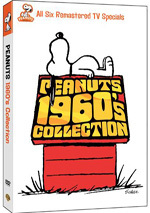 Happiness Is… Peanuts Snow Days appears in an aspect ratio of 1.33:1 on this single-sided, single-layered DVD. Due to those dimensions, the image has NOT been enhanced for 16X9 televisions. Both episodes came with ups and downs. Skate provided the more appealing show, largely due to sharpness. Though not without some soft spots, the program usually displayed pretty good accuracy and precision. Source flaws came up mostly in the form of bad clean-up animation; that resulted in marks and lines, but not a lot of actual debris appeared. Colors were the weakest aspect of Skate. At best, they tended to be somewhat flat, and they could occasionally look wrong. For instance, we sometimes saw purple faces, and general accuracy of the hues remained iffy. Blacks were deep and tight, though, and low-light shots looked fine. Despite the inconsistent colors and erratic clean-up work, this was still a “B-“ presentation. “Episode 18” offered weaker visuals. Colors remained a problem, though for a different reason, as the hues tended to be awfully pale. Facial complexions were milky white; some other tones work a bit better, but they usually seemed pretty flat. Sharpness was mediocre. Some shots demonstrated good clarity, but others came across as fuzzy. The image took on a “digital” look with a lot of roughness. Source flaws showed the usual array of specks and marks. This wasn’t a total disaster, but it didn’t merit a mark over a “D+“. Recorded five years apart, the monaural audio of the specials came with their own qualities. In this case, “Episode 18” worked better. At times the lines could be a bit hollow, but they were usually acceptably concise and natural. Music lacked much punch, though, as the score and songs tended to seem thin and dinky. Effects were okay; they had little heft but didn’t suffer from any overt concerns. Skate sounded a little weaker, mostly due to issues with speech. Dialogue usually appeared reedy and brittle; the lines remained intelligible but not better than that. Music was still pretty lackluster, and effects had little presence. Neither track excelled and this ended up as a “C” presentation. The DVD opens with ads for Happy Feet Two: The Video Game and Happiness Is… Peanuts Friends Forever. 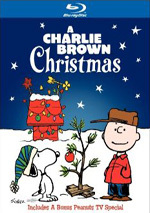 The disc also provides trailers for Santa’s Magical Stories and the Peanuts Holiday Collection. No other extras show up here. 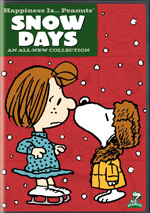 As much as I like the Peanuts comic strip, the franchise produced erratic TV specials over the years, and that held true for the inconsistent Happiness Is… Peanuts Snow Days. Parts of the DVD’s two programs have fun moments, but neither excels. The DVD comes with mediocre picture and audio and lacks supplements. I’d leave this for Peanuts die-hards, as it lacks much value for anyone else.